Decisions have to be based on facts. Many business intelligence solutions are very expensive. We offer you the entry into the world of reporting using highly sophisticated Business Intelligence Software. 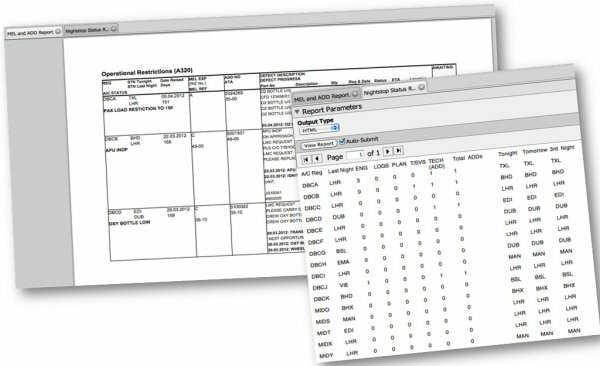 With Live Data Dashboards developed by CrossConsense you can show live data in an easy to grasp format. We offer big screen solutions as well as solutions adapted to your needs. The example on the left shows a dashboard development for one of our airlines customer. One step up the ladder we find reporting. It is obvious that business has many reporting requirements. AMOS by now has its own Report Designer module and we advise to use it whenever this is feasible (we can also help you building Report Designer reports) but unfortunately there are some limitations. CrossConsense helps you to bypass these limitations. Interfacing between two systems in a way is the most basic service we can provide. If you need an interface between AMOS and another software, just let us have a look at it. 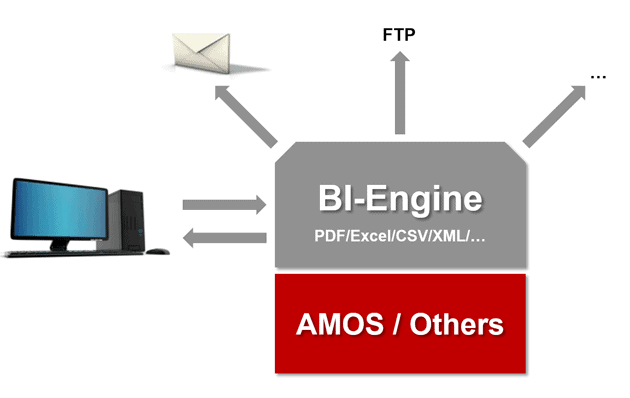 When doing interfacing on the AMOS side we always have the option of directly accessing the database but as long as AMOS provides an official interface which offers/consumes the data needed we obviously prefer going this way as it is more future proof.